Finished tapping the holes on the backside of my Moxon Double Screw. 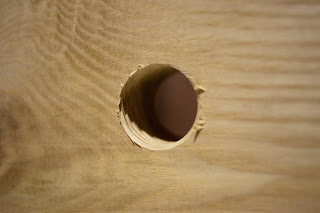 Few things, even with a sacrificial backing, the ash is prone to blowing out the back when drilling through. I suppose if my marking was good enough, I'd have the confidence to drill part way through and finish from the opposite side; I don't. The drill press is an interesting machine. It doesn't really seem to come equipped capable of any sort of repeatable or accurate drilling, which is ironic. It definitely needs an aftermarket or homebrew table to permit consistent placement and repeatable results piece to piece. Lastly, tapping a 1 1/2" wood thread through 8/4 ash is a decent workout. Those skinny woodworkers must be a wiry bunch.